When we say the fill of a chart component, we mean the color of the chart component like the Chart bars, the Chart Plot Area, the Chart Area e.t.c. In Microsoft spreadsheet program known as Excel, the fill of a Chart component can be formatted with Solid Color(i.e. one color), Gradient, Pattern fill, and even Image that is in your machine., and to do this, just follow the instruction below. In the example below, we will be using the Pattern Fill option to format the chat bars. Double-click on the Chart Bar you want to format, and a Format Data Series taskmenu will appear at the right side of the Excel 2016 Windows. 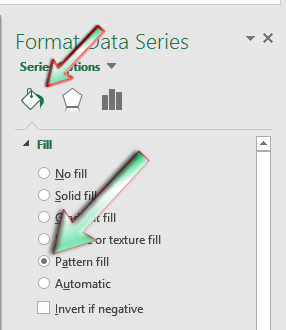 Check on the Pattern Fill radio option. When you do, the changes will be automatically applying to the chart component you double-clicked on. Note: No matter the Chart component you want to change format it's fill, just follow the steps above and you are on the right track.